The mummichog,Fundulus heteroclitus, is one of the most important macrofaunal components of salt marsh surfaces and an important link to subtidal areas of the adjacent estuary along the east coast of the U.S. We estimated growth, population size, and production of the mummichog in a restored marsh in order to improve our understanding of the role of this resident fish and to evaluate the success of the restoration. The restored marsh, covering 234 ha, was a former salt hay farm located in the mesohaline portion of Delaware Bay that was restored to tidal influence in August 1996. We separated the mummichog population into two components based on life history stage and summer habitat use patterns. 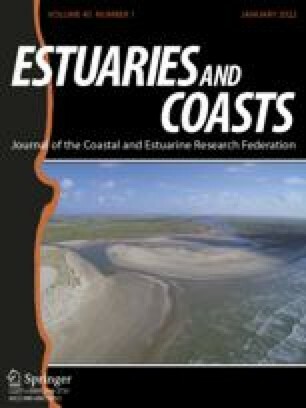 One component, consisting of adults and large young-of-the-year (YOY), exhibited tidal movements to and from the marsh surface and the subtidal creeks. These were examined with an intensive mark and recapture program using coded wire tags. Another component, consisting of small YOY, remained on the marsh surface throughout the tidal cycle. Throw traps were used to sample these small YOY. The mean annual population density of adults and large YOY for the entire marsh was approximately 1.2 fish m−2 and mean monthly density peaked at 2.9 fish m−2. The mean annual density of small YOY on the marsh surface was 15.1 fish m−2 and mean monthly density peaked at 41.4 fish m−2. Size and season influenced the growth rate of individual fish and instantaneous growth rates ranged from 0.03 to 2.26 mo−1. Total annual mummichog production was estimated to be 8.37 g dw m−2 yr−1, with adults and large YOY contributing 28.4% (2.38 g dw m−2 yr−1) and small YOY on the marsh surface contributing 71.6% (5.99 g dw m−2 yr−1). The seasonal use and population densities were comparable to previous studies in natural marshes while growth and production of mummichog in this restored marsh appeared to be higher. Coupled with the results of other studies on the feeding, movement, and habitat use of this species in this restored marsh, the species has responded well to the restoration.